In this post we preview the best day packs for hiking of 2019. When you want to head out on a day hike, a critical piece of kit you need to have with you is a day pack. A day pack is a small backpack that enables you to carry all the necessary bits of kit for your day hike. So, that bit of food for a snack and your lunch, the all-important water to keep you hydrated and a place to keep extra layers of gear should you need to put them or a place to put them if you take some off. Most of the day packs listed here are unisex, however, we will be adding a specific post that deals solely with specific backpacks for ladies in the coming weeks. Buy On Amazon Now! Buy On REI Now! Lots of excellent pocket options that are both functional and practical e.g. front pocket for storing wet gear, zip hip belt pockets for easy access items on the go, etc. Plenty of practical hiking features e.g. hydration sleeve, key attachment, helmet, ice axe and trekking poles attachment, etc. The is our top day pack recommendation. Good for day hiking all year round, it offers a lot of functional capability in a stylish looking design and construction. 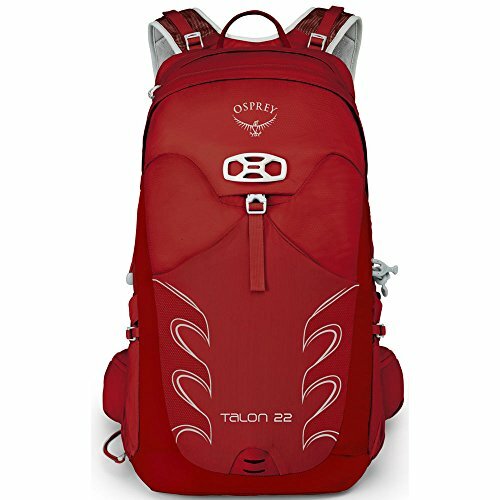 Get the Osprey Talon 22 on Amazon now! The Talon 22 is constructed using a combination of 70D x 100D mini-shadow nylon and 210D nylon block dobby. This material provides a tough and strong material which will stand up well, to use and abuse on the trail. The pack also features AirScape suspension, which is a trademark mesh that helps air circulate around your back as you wear the pack on the move. The pack is secured using a BioStretch Harness (mesh covered die-cut foam), which is a gender specific built-in hipbelt, so it can be easily adjusted to different body sizes and shapes. The die cut slotted hipbelt also features zippered stretch mesh pockets, more on that further below. The pack also secures around the chest using an adjustable sternum strap, which also features a rescue whistle, which is always handy to have! Overall, the pack volume comes in at 20L (1220cu in) for the small/medium and 22L (1343cu in) for the medium/large. In terms of storage, as well as the main compartment, which is accessed via a zipper closure, the pack also features a stretch front pocket, stretch mesh side pockets with InsideOut™ compression, a stretch pocket on the harness and, as referenced above, two zippered hip belt pockets. All the pockets are well designed, functional and easy to access. The pack features a hydration sleeve so you can easily pack water for easy access on the move. The pack design and construction also provides the ability to attach a helmet, tools, like an ice axe, and carry trekking poles when they’re not in use. An internal key attachment clip and LED light attachment point are also featured. Note, a rain cover is not included with the Talon 22. In terms of the retail price, the Osprey talon 22 comes in at around the $100.00 mark. Given the quality construction and amount of practical features on the pack, we feel it’s a good price, and you’ll get a lot of excellent use out of it. The Talon 22 is also available in four different colors, Black, Martian Red, Spring Green and Ultramarine Blue. Finally, the Talon line of packs from Osprey has been around for a long time, so there are numerous iterations of improvements included in this latest version. It’s also worth noting, that both smaller and larger capacities are available, for example the Osprey Talon 11 and the Osprey Talon 33. In our opinion, the Talon 11 is too small to be a functional daypack for hiking, but the 33 could work well, if you need to carry more extra layers than will pack into the Talon 22. However for most day hikers, 20 to 25L capacity should work pretty well. Before we move onto more great daypacks, we wanted to have a brief look at what you need to be thinking about before you buy a daypack. First and foremost, you need to know what you need a pack for. This gets easier as you get more experienced with hiking, but when you’re new to hiking, it can be a bit confusing. There are so many different sizes of packs, from day packs to back packs … what’s the best option for me!? What will meet my needs!? While this article is specifically about day packs, it’s worth looking into this on a broader scale for a moment to help illustrate what we mean. Where are you going hiking? Are you going for a few days? Will you need to wild camp? Are you only ever day hiking? If so, for 2 hours or 10 hours? Will you be hiking in hot conditions and so may need to carry less extra gear? Or, will you also be heading out in the middle of winter when it’s near zero degrees at the summit of the peaks you want to climb? As you can see, the answers to all of these questions will have a large impact on the kind of pack you need to get. Now, as mentioned, this page is about daypacks, so we’re not talking about backpacking or camping for a night or two here. That immediately excludes the bigger internal and external frame backpacks. However, even within the smaller range of daypack sizes available, there is still a lot to consider. If you’re completely new to all this and you’re not 100% sure what your needs are and what specific things you should be looking for in a day pack, check out the day pack buying guide. It runs you through everything you should consider and what features are good to have in a day pack. We recommend a 20 to 35 liter day pack as something in that range should do you all year round. It has that bit of extra space for extra layers should you need to carry more gear at colder times of year. At hotter times, you just have less kit in it, so no problems there. Remember, do your homework first! Depending on the result of your investigations based on the buying guide i.e. deciding what you need your day pack for, what type of hiking you’re doing, what kind of climate, etc. a 30 to 35 liter or 20 to 25 liter day pack, may be a better option for you. Ticks all the basic boxes for a basic functional day pack for the trail, that can easily be used for other purposes e.g. travel, etc. Second on our list is the Flash 22 daypack from REI. REI are a well-known and respected outdoor store, who sell their own brand products as well as label branded products. We’ve pegged this as our best budget day pack recommendation. Get the REI Flash 22 on REI now! The Flash 22 is constructed using a durable nylon material. The shoulder straps are adjustable and feature lightly padded stretch-mesh. They move freely to provide comfort as you hike on the trail. The pack also features a mesh back which is soft, breathable and lightly padded for further comfort as you hike. The pack is secured using a waistbelt and sternum chest strap, both of which can be detached if required. At 22L (1343 CI) capacity, the Flash 22 sits in the range of what we would normally recommend for a day pack in terms of size and capacity. However, we did see comments on the measured size being more like 18L, which is a bit lower than what would be our ideal in terms of size, for a day pack. Again, if you are heading out on longer day hikes or need to carry a lot of extra layers on the trail, a 22L pack, may not be the best option, a larger pack may be more suitable. However, for a 4 to 5 hour day hike, an average for many hikers, you should be good with the storage capability offered by the Flash 22. In terms of storage, the Flash 22 includes a zippered lid pocket and a zippered pocket on the front, as well as stash side pockets that can hold water bottles, or other essentials, that require easy access on the move. The Flash 22 has an internal sleeve which can accommodate a hydration reservoir, and includes a port for the sip tube to be out front, over either shoulder. The Flash 22 pack also features tool loops on the top and bottom of pack, perfect for attaching trekking poles when not in use. These tool loops can also be tucked away when not needed. In terms of the retail price, the Flash 22 comes in and around a wallet friendly $54.95. That’s a good price for a day pack specifically designed with hiking in mind i.e. it includes the main functional hiking features you would need. Overall, a decent deal to be had for a decent and functional day pack. The pack is also available in four different color options, black, marigold, spa blue and quiet shade. As stated at the start, we feel this is the best budget daypack option, so while not as functional and expansive as some other options, it gets some extra weighting in terms of value for money. Deuter are another top quality brand who are really well known for making outdoor activity specific equipment to a very high standard and quality. In truth, the Deuter Speedlite 20 daypack was a close contender for our first choice as it sports an excellent design, specifically set-up for the outdoors. Get the Deuter Speedlite 20 on Amazon now! Starting with the material construction of the pack, the Deuter Speedlite is made up of a material called DYNAJIN 210 which is a Polyester: 30% / Polyamide: 70% composition. The nylon is a very hard wearing 420D nylon and 210D nylon, which also features a PU (Polyurethane) coating to provide an element of water resistance in the fabric itself. The tight weave of the special high density denier polyamide offers serious high abrasion resistance. The pack also features a reinforced base, so you can leave it on the ground in any conditions and it won’t tear. All of this comes without impacting weight and the pack weighs in at a comfortable 490g (17oz). The pack features padded and wide S shaped AirMesh shoulder straps which are adjustable, a height-adjustable chest strap and a removable hip belt. All of these options provide the capability to get a very secure and comfortable fit to any body shape. In terms of volume, the Deuter Speed Lite comes in at 20L (1220cu in), so in the good enough range for a short to medium day hike, in better conditions. It is also perfect for a summit day on a longer trek. For longer day hikes, you may need to look for something with a bit more capacity. The dimensions of the pack are 46 / 26 / 18 (H x W x D) cm. In terms of storage, the Deuter Speed Lite includes a main compartment which is closed using a zipper. The pack also has a front stuff pocket, handy for stuffing a wet layer into, to keep out of the main pack. The Speed Lite also features two mesh side pockets, for water bottles, and an internal secure pocket for valuables like keys and so on. The Speed Lite also features 3M reflectors for visibility and reinforced pull loops on zippers, as well as an SOS-Label with life-saving tips for emergencies, a nice touch. Tool attachment loops also come on the Deuter Speed Lite, so you can attach a helmet, ice axe or trekking poles, should you need to. The Speed Lite is hydration pack compatible, and can take up to a 3L reservoir, which is an excellent amount to be able to carry comfortably, with an easy access H2O port on the side, so you can access water on the move. The pack is designed so the load you carry is kept close to the body. Flexibility is provided through innovative ventilation and stabilization features, which all go to ensure you have an optimized fit, which ensures comfort and excellent load transfer to the hips. In terms of the retail price, the Deuter Speedlite comes in at around the $75.00 mark. We think this is an excellent price for what you get in the Speed Lite. The pack is available in four different color options, petrol-arctic blue, bay-midnight blue, black and cranberry-maron red, so a good range of options to choose from. Overall, what we really like about the Deuter Speed Lite is its minimalistic yet very functional design, in the fact that there is no fluff, and every feature has a necessary and functional purpose for a hiker. Next up, we take a look at the Litus 22 pack from The North Face. The North Face are probably the most well known outdoor gear brand around, so they shouldn’t need any explanation as to who they are and what they’re about. They’ve been around a long time delivering quality gear for a wide range of outdoor sports and activities. Get the Litus 22 on REI now! The material construction of the Litus 22 is 100D geo weave nylon for the body of the pack, and 210D geo weave nylon for the boot. The material is tough, abrasion resistant and lightweight, just what you need in a daypack. Let’s look at some numbers to help give a complimentary idea of shape etc. The pack comes in two sizes, a small/medium at 20L (1220cu in) and a large/x-large at 23L (1404cu in). These have a claimed weight, respectively, of small/medium at 737g (1 lbs. 10 oz.) and the large/x-large at 765g (1 lb. 11 oz.) The dimensions of the pack are small/medium 45 x 32 x 18in and large/x-large 50 x 32 x 18in (H x W x D). All in all, like any good day pack, in the Litus 22 we have a pack that is a good size for a short to medium day hike, and perfect for a summit day on a longer trek. As already referenced above, for longer day hikes, you may need to look for something with a bit more capacity depending on your needs. The pack features a trampoline-style suspended mesh back panel with contoured Atilon sheet, which provides additional breathability. The aim of this feature is to enable ventilation around the body where the pack rests, to help ensure comfort as you hike. The pack is secured with a waist belt and chest strap. The waist belt is fixed but both of these are adjustable using the straps to ensure a comfortable fit, and to help adapt to varying body shapes. In terms of storage, the Litus 22 includes a main compartment with deep zipper access. The Litus 22 also features an exterior pocket and stuff pouch, an interior security pocket, for keys and such, and hip belt pockets, handy for small item access while on the move. Webbing lash points and dual pole / tool attachments are available on the pack, so you can attach tools as required e.g. an ice axe, trekking poles, etc. should you need to. The Litus 22 is hydration pack compatible (hydration pack not supplied), so you should be able to use your existing water reservoir with the Litus 22. The hydration reservoir is accessed using a H2O port on the back of the pack. In terms of the retail price, the Litus 22 comes in at around the $99.00 mark. This is definitely at the higher end of the scale for a day pack, but you do get a quality offering for the investment. The Litus 22 is available in several different color options e.g. blue, black, grey, etc. Our favorite thing about the Litus 22 is its sleek look and design. It almost has an aerodynamic feel to it, which looks pretty cool in our opinion. Aside from that, it is of course a very functional pack which does what it needs to do for the average day hiker. 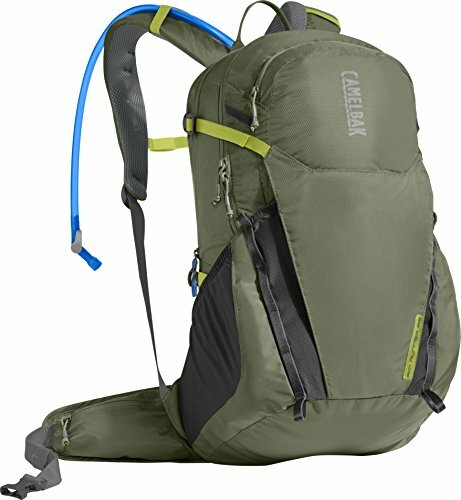 The Rim Runner 22 from Camelbak, is another pack designed with day hiking specifically in mind. Camelbak are another quality brand who offer some really excellent products, again for a wide range of outdoor sports and activities. Get the Camelbak Rim Runner 22 on Amazon now! The material construction of the Camelbak Rim runner is 70D x 210D nylon dobby, 420D nylon plain weave, so again, the material is tough, abrasion resistant and lightweight, perfect for a daypack. In terms of capacity the Rim Runner offers 19.5L (1150 cu) capacity, so a decent amount of space to pack in your day hike essentials e.g. lunch, an extra layer, etc. The claimed weight of the Rim Runner is 730 g/1 lb 9 oz. with dimensions of 50 x 27 x 24.5 cm / 19.7 x 10.6 x 9.6 in (H x W x D). Like all the packs featured on this page, the Rim Runner is perfect for short to medium day hikes, or a peak ascent on a longer trek. The pack features a breathable air mesh back panel, which adds to the pack being lightweight as well as providing a comfortable fit. The mesh also allows good breathability and ventilation, so air can move in and around your back as you move and build up heat. The pack is secured with a hip belt and chest strap. The waist belt is a load bearing hip belt which utilizes open mesh to maximize breathability. The hip belt also features two cargo pockets, one on each side, for easy access essentials. In terms of storage, the Rim Runner has a good selection of pockets including the aforementioned 2 hip belt pockets, 1 organizer and stretch overflow exterior pockets for quick access and to stash stuff away. External attachment points are featured in the pack, so you can attach trekking poles and other tools, for easy carrying, when not in use. The Rim Runner pack comes with its own hydration pack, the Camelbak Crux reservoir which features a standard port with an easy to use on / off lever. For the retail price, the Rim Runner comes in at around the $99.95 mark. Again, we are definitely at the higher end of the scale for a day pack, but that is to be expected with all the hiking specific features this pack offers, including coming with its own hydration reservoir. The Rim Runner from Camlebak is available in several different color options e.g. lichen green/dark citron, aura orange/charcoal, charcoal/grecian blue and grecian blue/pumpkin. The Rim Runner 22 is another well designed and sleek looking day pack, which offers all you need in a pack for shorter day hikes and peak ascent days. The fact it comes with its own reservoir is a nice addition if you need to invest in one too, and we recommend you do, as we think it’s the best way to carry drinking water on the trail. Claimed weight: 730 g / 1 lb 9 oz. As referenced above, Osprey are a well-known brand for making quality and functional backpacks. The Osprey Daylite Plus pack is another excellent daypack option from Osprey that is great for short to medium day hikes on the trail. Get the Osprey Daylite Plus pack on Amazon now! The main fabric of the Osprey Daylite Plus is 210D Nylon Oxford, which is a lightweight, flexible nylon fabric. In brief, to give a bit of an explanation on what 210D means, the ‘D’ in 210D stands for ‘Denier’. Denier is a unit of measurement that is used to determine the fibre thickness of individual threads or filaments used in the creation of textiles and fabrics. So, in short, the higher the rating, the thicker and sturdier the fabric tends to be. 210D is a high rating so, the fabric on this pack is tough and durable. The shoulder straps are adjustable and are constructed using mesh, so your shoulders can breathe easily as you move. The pack is secured using a waistbelt, which can be detached if required, and a sternum chest strap which also features an emergency whistle. The pack also features quick release compression straps on the side, which are easy to operate to help you secure the pack close to your body. In terms of volume, the Daylite Plus comes in at 20L, so just about good enough for a short to medium day hike, in better conditions. If you plan to head out on longer day hikes or need to carry a lot of extra layers on the trail, say in colder weather, we recommend looking for something with a bit more space, say 25 to 35L, as 20L may not be enough to carry all you need. 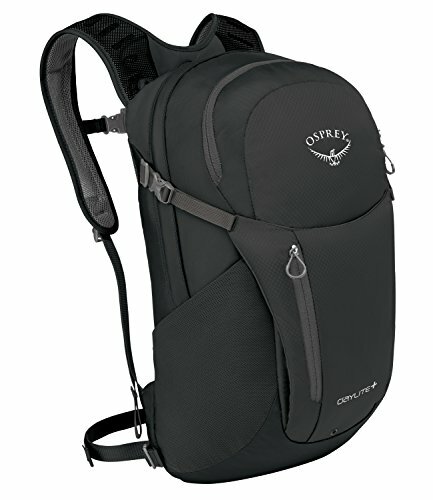 In terms of storage, the Osprey Daylite Plus backpack includes a main compartment, which is closed using a zipper, a further zippered front compartment with mini pocket holders inside, and a zippered stretch pocket on the front, handy for storing an easy access layer should you need it. The pack features a padded laptop and tablet sleeve, while not a requirement for a day out on the trail, this could be a useful addition for those wishing to use this pack for multiple purposes e.g. moving around town as well as day hiking. This also doubles as a space for a hydration reservoir. The pack has twin side mesh pockets, which can be used to store water bottles, or other essentials, that require easy access on the move. The Daylite Plus pack has external hydration access with a H2O port at the back, so you can access water on the move. However, the pack is designed to work specifically with the Osprey Hydraulics™ and Hydraulics™ LT Reservoir, so if you already have a hydration pack that you wish to use with this, you should check that it will be compatible. The Daylite Plus pack does not feature tool loops, so you can’t attach trekking poles, etc. when not in use. The pack is also designed to attach to other larger Osprey specific backpacks / travel packs, specifically the Aether AG, Ariel AG, Farpoint 80 and Sojourn. This is useful for backpacking and travel, if you plan to set up a camp or base in a location and then do day hikes or short trips out from your base. In terms of the retail price, the Osprey Daylite Plus comes in and around the $60.00 mark. It’s not a bad price for what you get. The pack is also available in six different color options, solar yellow, black, stone grey, eggplant purple, real red and tahoe blue, so plenty of options to choose from. In terms of hiking, we feel it would be nice to have a few extra features on this pack. However, if someone is a casual day hiker and needs a pack more for day-to-day use, this is a viable and functional option. The Marmot Kompressor 18, is another good day pack option that is worth a look if you’re in the market for a daypack. Again designed for the purpose of day hiking specifically in mind, the Kompressor is constructed using 70D 210T nylon ripstop for the main material, 210d 100% Nylon Double Ripstop for the reinforced parts, with a lining of 135d 100% Polyester. So while the material is tough and abrasion resistant, at those levels we think weight was likely the priority in terms of design and construction. In terms of capacity the Kompressor offers 18L (1100cu in). Honestly, we feel that is a bit on the smaller side for a day pack, but if you have ultra-lightweight gear that easily packs away, you should still be good with that capacity. The claimed weight of the Marmot Kompressor is 10.22oz (290g), so it will work well for shorter day hikes and summit days on a longer backpacking trip. The pack also has a removable backpanel, which is in keeping with the ‘fast-and-light’ capabilities that are clearly intended with the design. The pack features Airmesh shoulder straps which help enable ventilation as you move. Again, this adds to the pack being lightweight as well as providing a comfortable fit. The mesh also allows good breathability and ventilation, so air can move in and around your back as you move and build up heat. The pack is secured with a chest strap`only. We definitely prefer a hip belt as well, but given the smaller size of the Kompressor, this works OK and again, is in keeping with the ‘fast-and-light’ design. In terms of storage, the Marmot Kompressor features one main compartment and has a hydration sleeve for a reservoir (not included). The pack features a light clip and external attachment points to carry tools like an ice axe. The pack also stuffs into its own lid, so it can be packed away. For the retail price, the Marmot Kompressor comes in and around the $49.95 mark, so pretty accessible, and in line with other pack price points featured here. However, keep in mind that you don’t get as much functionality and features with this pack, as you would with others, and that is reflected in the seemingly cheaper price. 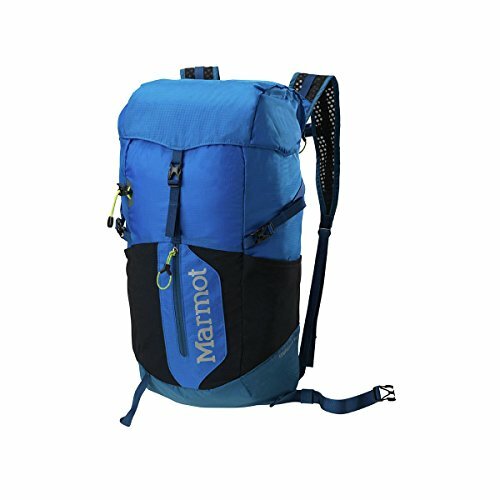 The Marmot Kompressor is available in multiple different color options as well e.g. black, citronelle / olive, cinder / team red to name just a few. Overall, the Marmot Kompressor is a neat little pack for day hikes out on the trail. The only qualm we have, as mentioned above, is that we feel it is a bit on the smaller side, in terms of capacity. Ticks a lot of the basic boxes for a basic functional day pack for the trail, that can easily be used for other purposes e.g. travel, camping, etc. No additional attachment options e.g. trekking poles, helmet, etc. The Venture Pal daypack is our best daypack choice in the ultra budget category. For someone who is not a full on hiker or is maybe just dipping their toes in the water, in terms of hiking, and doesn’t want to invest in a more expensive daypack option just yet, the Venture Pal is worth a look as it very budget friendly. The Venture Pal pack is constructed using a high quality tear and water resistant nylon material. This provides extra strength and durability, while not being too heavy. The bottom of the pack is reinforced, in terms of strength and durability, by a double-layer bottom piece. This helps ensure you can securely carry your load on your longer day hikes out on the trail. The shoulder straps in the Venture Pal feature Breathable mesh with plentiful sponge padding, which helps to relieve the stress on your shoulders. The length of the shoulder straps is of course adjustable to help you get the desired fit. The pack is secured using a single chest strap which also features a whistle buckle, to help you attract attention in an emergency. 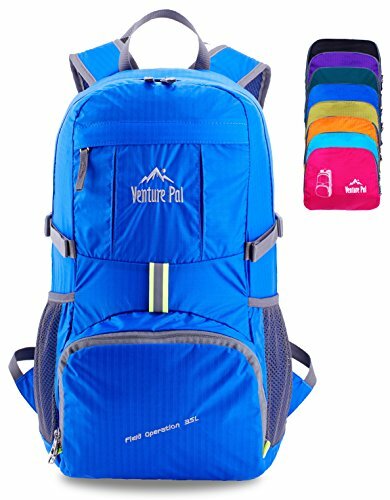 The Venture Pal, is at the higher end of the size range in terms of day packs, coming in at 35L (2135cu in). There is a 25L (1525cu in) version available, but it does not have all the same features the 35L has. If you are heading out on longer day hikes or need to carry a lot of extra layers on the trail, a larger 35L pack is not a bad idea. That extra space is great for emergency gear like a bothy bag, first aid kit, a few extra emergency layers, etc. so keep that in mind when purchasing. In terms of storage, the Venture Pal features one main zipped compartment, two zipped front pockets and two side pockets. As we have already touched on, the main compartment is the main storage area, which provides 35L (2135cu in) of space. The pack is also lightweight coming in at about 0.7 lb. The main compartment is split using two separators, which provides more options for organization. The pack also utilizes two heavy duty two-way SBS metal zippers for access into the main compartment, so you can use these from any side you prefer. There are two front pockets which are good for holding small accessories like gloves, hat, sunglasses, etc. as well as two mesh side pockets, typically used to hold water bottles and the like. An interesting feature of note, is that the pack folds into its own zipped inner pocket, so the pack itself can be packed away into a sandwich sized bundle! Handy for packing on a larger suitcase or travel bag. The Venture Pal does not feature a hydration sleeve, nor does it have a built in rain cover or any additional attachment options for trekking poles, ice axe, helmet, etc. In terms of cost, the Venture Pal comes in and around a very wallet friendly price, so with that in mind, you of course can’t expect to have all the same feature options a more advanced design day pack would have. The pack is also available in a large variety of color options. As stated at the start, we feel this is the best ultra budget option, so if you don’t want to invest in something more expensive, this is a viable option, but set your expectations accordingly. In this section we review some of the common questions people have about daypacks. We’ll be updating this as more common questions come up. Q1. 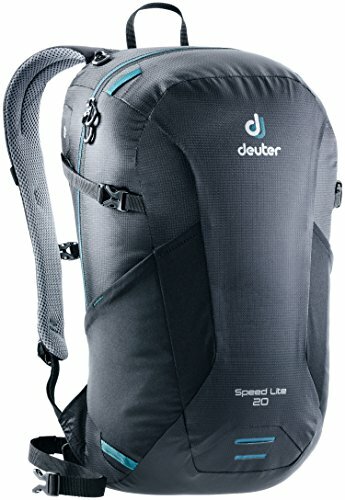 What is the ideal size for a daypack? Typically, 20 to 25 liters is a good capacity for a daypack, however, this is not always the case. For example, say you hike in winter in Autumn and the temperatures can fluctuate on a day quite significantly between warm and very chilly. For those conditions, you will need to be able to change layers as you need to. When you’re not wearing your gear, you have to store it somewhere, so you may find that 20 liters could be a little tight. Next up, some people are just bigger, so their spare gear will be bulkier and take up more space, so a bigger day pack may be needed. On the flip side, people who are smaller, may need less space. Do you drink a lot of water? I do, I can drink up to 3 liters on a long hike, so I need to carry a 3 liter hydration reservoir with me. I have friends I hike with, who would only drink a liter on the same hike. Clearly, they don’t need to that extra space to carry the extra water. One last example, is say if you are the lead of your hike, I don’t mean in an official capacity like a mountain guide, but say if you are taking you family out for the day, and by default, you are the leader. It is advisable to carry extra gear for emergencies, extra hats, gloves and so on, just in case someone loses something. You should also have a suitable first aid kit and safety equipment, like a bothy bag / emergency shelter. This of course takes up space, so you may need a bigger pack to carry it all in. The overall point, as with anything hiking gear related, is that you need to take your own unique requirements into account. I personally run with a 25 liter daypack for most normal day hikes, I’m 6 feet tall so I need a bit of extra space for my gear, and I can carry a 3 liter hydration bladder in it. However, if I am leading a hike I use a 45 liter backpack to carry all the safety gear and spare bits and bobs I need for leading a group of people into the mountains. Q2. What extras should I look for in terms of functionality? Personally, I like good functional pockets, that are easily accessible and work well. I like good backpack loops, which I do use from time to time to secure hiking poles or the like. Your daypack should also be easy to adjust to get a good fit, out something in it to give it a bit of weight, and then try it on and hook up all the catches. Try adjusting it as you walk around. It should feel secure and it should be easy enough to adjust. Comfortable shoulder straps are important too. Next up, having a hydration sleeve with a tube port and catch on the straps of your daypack is the way to go for carrying your drinking water, in our opinion. Most good packs come with an hydration sleeve as standard these days. Finally, good airflow and ventilation in and around your back is a really good idea. Most modern packs make a good effort to get this working well, so you don’t build up too much heat on your back. The pack should sit off from your back a bit, allowing air to move freely. If you don’t have this, you will get hot and sweaty in and around your back very quickly, and it isn’t pleasant. Q3. Is a built-in rain cover a good thing to look for in a daypack? If you are going to use a rain cover, then definitely get one that is built into the pack itself, these typically stow in a pocket at the bottom of the pack and are attached to the pack. The fact it is attached is important, as in high wind, trying to fit one on that is not physically attached as part of the pack itself, is a real pain and you run the risk of it blowing away. There is a question on whether a rain cover provides any real protection from the elements anyway. At best, it provides a bit of protection and my approach to it is, well, why not use it if you have it. It will not keep heavy rain from getting into your pack though, I am certain about that. There are ways to protect your gear in your pack, effectively waterproofing your pack and your gear. Dry bags or a pack liner are the ticket here. I use dry bags in conjunction with the built-in rain cover in my day pack. I do not rely on the rain cover in any way though, the dry bags to the protecting and keeping the rain from getting at my gear. Q4. What budget will I need for a good and functional hiking daypack? Hard to be specific with this, as everyone’s needs are different. There are always high-end options available which cost more, and budget options which will cost less but may not last for long. I think anywhere between $80 to $150 is a very decent budget for a good daypack (there always sales and bargains to be had that knock a bit off that too). You can certainly get one cheaper, but you run the risk of poorer quality by doing that. Nine times out of ten, spending a bit more gets you a better pack, or any piece of hiking gear for that matter. Any savings by getting cheap items usually ends up as a false economy, as you end up having to replace the cheap stuff more regularly as it just doesn’t last as long as better more expensive gear. In fact, the extra investment into better gear, probably works out much more economical over the long haul. Q5. Should I try and buy a well-known branded daypack? You are paying extra for a brand-named product, there is no doubt about that. However, typically, a branded product provides some level of guarantee, or comfort, in terms of quality. That’s part of the reason that people pay more for a brand name. Does that mean that you can’t find a bargain with an unknown brand or discount store product? Absolutely not, there are always deals to be had and gems to be found. However, when you go down that road, you typically have no way of making a reasonable guess as to what the long term outcome will be, so keep that in mind if you choose to do this. Q6. What else can I do to help me pick the right daypack? Aside from reading pages like this one on gear review sites, it sounds obvious, but user reviews are an excellent way to get a feel for whether a pack will work for your needs. If you find a daypack that you like the look of, check for it on Amazon and on other retailers’ websites and read the user reviews that people leave there about the product. Look for verified purchases i.e. people who genuinely bought the product, to avoid any potential gaming of the system, especially if you are buying from an unknown and cheaper brand. The reviews people leave behind can tell you a lot about a product. The more reviews the better. If you find a product with 2000 genuine reviews and it has an average score of 4 out of 5 stars, it is reasonable to assume the product is pretty decent. Then go into the detail a bit more, look out for repeating patterns or comments on user experience in the reviews themselves. If you have specific needs or requirements, look to see if they are addressed in the reviews, or perhaps in the questions that people often leave for the manufacturer, or fellow users who already have the product. These days there is a wealth of information available at the scroll of a screen or the click of a button, so you should be able to steer yourself in a good direction with regards to this. Below are some additional daypack resources which you might useful when trying to decide what to get. Another look at how to choose a daypack – the perspective on this from the team at REI. Some excellent general guidelines on choosing a backpack from Sierra Trading Post – I like how this is laid out. So that’s it for this review of the best daypacks for hiking of 2019. We hope you found these recommendations useful, and that they help you pick the right day pack for your hiking needs. As always, take your time and educate yourself well in the process and, most importantly, be clear about what you need your pack for. Remember the day packs listed here are good for day hiking, but not suitable for longer hiking trips or backpacking trips, you need something bigger for that. Knowing what you need your pack for is key. Read the hiking daypack buying guide first, that will walk you through all the many things you need to consider when choosing a day pack. When you've done that, have a good think about how much stuff you need to carry with you on your day hikes, at different times of the year. In short summary, know what your needs are, before your purchase. We’ll be updating this as things change but these are our recommendations for now. If you've any questions on any of this or if we can help in any way, feel free to leave a comment or send us a note via the contact page. We are always happy to help if we can.